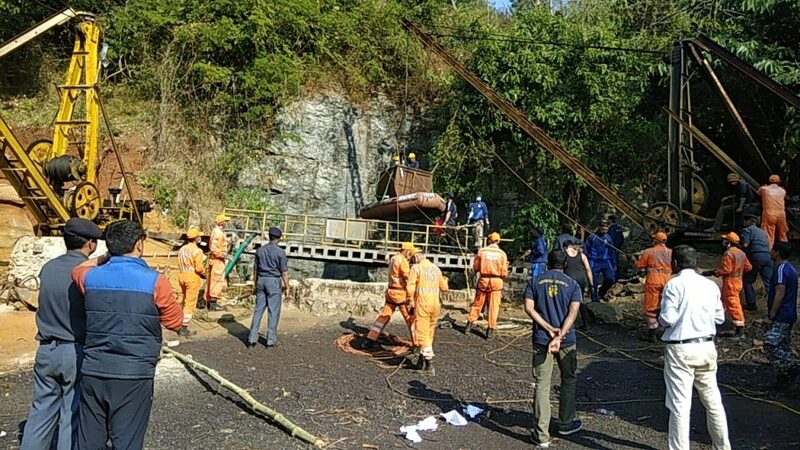 Indian Navy divers are struggling to retrieve the second body of a miner inside an illegal flooded 370-feet- coal mine in Meghalaya’s East Jaintia Hills district, where 13 more remained trapped for 51 days now. The Navy divers facing the obstacle of high turbidity of water inside the mine, an official said on Saturday. The body of the unidentified miner was detected a week ago by an underwater remotely operated vehicle (UROV) after it had stumbled on tell-tale signs like spades, a wooden cart and then located the dead miner. “The turbidity is limiting their visibility inside the rat-hole mines besides too many obstructions in retrieving the body. They aren’t unable to see and avoid polythene, loose ropes which as such would be carried along by the miners,” a senior rescue official said. “Nonetheless, they (Navy) are making all efforts to retrieve the body and this (retrieving the body) will possible only once the water is clear. We are trying to find out a solution to this turbidity problem and are consulting experts’ opinions,” he said. The UROV of the Indian Navy found the first body of a miner identified as Amir Hussain of Assam’s Chirang district on January 16 — 32 days after 15 miners got trapped inside the illegal rat-hole coal mine on December 13 as water gushed in. The accident inside the illegal coal mine came to light after five miners escaped the coal pit. Meghalaya Home Minister James Sangma said that the search and rescue operation for the remaining 13 miners trapped inside the mine as per directions of the Supreme Court. The apex court is monitoring the search and rescue operation. On Monday, a platoon of Indian soldiers joined the multi-agency search and rescue operation at Ksan village, about 130 Km from Meghalaya’s capital Shillong.